Download "Adjudications are lawsuits that take place in state"
4 3-4 Water Matters! Adjudications Stream System Issues Phase: Stream system issues are matters that affect the stream system as a whole, or alternatively, a large group of claimants. These issues may be addressed at any stage of the adjudication depending on the judge s preference, or when an issue arises. They can involve matters such as the priority date for the parciantes on an acequia, or the duty of water, that is, the amount of water right delivered to each acre for an entire stream system. Errors and Omissions Phase: The errors and omissions phase is conducted after all subfile orders are entered. It is designed to clean up the adjudicated information prior to entering a final decree. Inter Se Phase: Inter se is Latin for among themselves and it is a time in the case when any claimant may challenge the water rights of any other claimant. No claimant, however, may revisit his/her own subfile. Following the entry of orders for each subfile in an area, the court conducts the inter se phase of an adjudication to resolve issues arising between water right owners. These challenges may go to mediation or receive a hearing. By resolving the challenges of any member of a community, the water rights are made final as against every other right as well as the State. If necessary, a court can conduct an expedited inter se before all orders have been entered. For example, objections to the water rights of the Taos Pueblo to the Rio Taos stream system are being resolved before all the non-indian rights have been determined. In order to complete this part of the adjudication and to meet deadlines in the Taos Pueblo Indian Water Rights Settlement Act of 2010, the Court is conducting an expedited inter se to determine whether to enter a partial final decree for the Pueblo. Stream system issues are matters that affect the stream system as a whole, or alternatively, a large group of claimants. Partial Final Decrees and Final Decrees: Once the inter se phase is complete, a court enters a final decree or a partial final decree. The final decree describes the rights adjudicated, and once entered, ends the case or a significant segment of the case. If an adjudication is divided into segments by geographic region or type of right, these segments can be conducted in full or in part, sequentially or concurrently, depending on the case management choices of the court and the parties. Thus a case may have several partial final decrees, which together resolve all of the water rights in a stream system. Expediting the Process Water rights adjudications throughout the West take decades to complete. Over the last ten years, the New Mexico courts, Office of the State Engineer, the and the legislature have explored ways to expedite these proceedings. Studies have been conducted, rules developed, and programs implemented to further this cause. New Mexico Supreme Court Rules: In 2002, the New Mexico Supreme Court established an ad hoc committee to develop and examine rules of procedure particular to water litigation and stream adjudications in New Mexico. The ad hoc committee researched several issues including: ex parte contacts; prohibitions on changing rules of procedures in pending cases; the legal nature of water rights; the inherent procedural difficulties in adjudications; the accuracy and updating of records; and standardizing procedures for all adjudications. Recommendations were submitted to the Supreme Court of New Mexico. In 2007, the Supreme Court issued provisional procedural rules for adjudications. These rules addressed the issues of service and joinder of water rights claimants; stream system issues and expedited inter se proceedings; an annual joint working session; ex parte contacts between the State and the court on procedurals matters; general problems of administration; and excusal or recusal of a water judge. In 2011, the New Mexico Supreme Court made the rules permanent. 6 3-6 Water Matters! 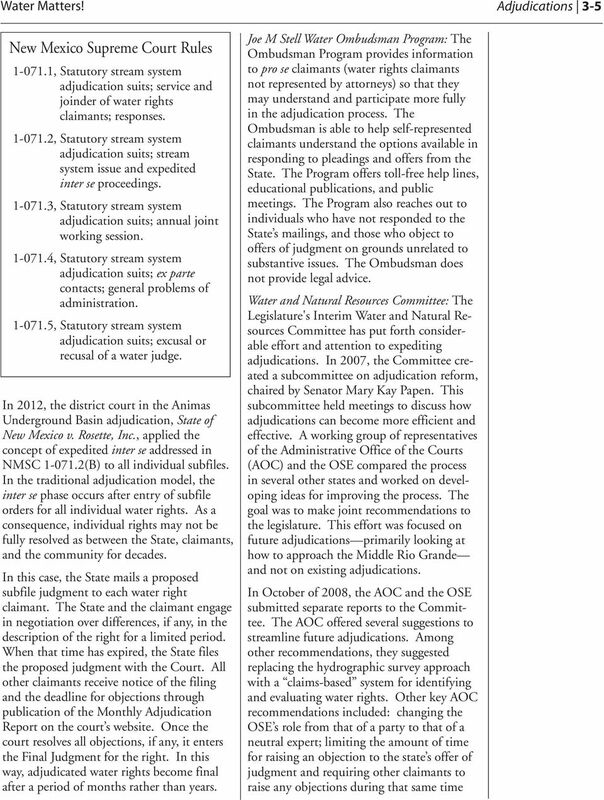 Adjudications The Ombudsman Program provides information to pro se claimants (water rights claimants not represented by attorneys) so that they may understand and participate more fully in the adjudication process. period; changing the method of notifying claimants of adjudication developments; and adjudicating claims on a rolling basis. The AOC recommended that before legislative action is taken, other input and suggestions for improvement should be obtained from stakeholders and water experts. The OSE s report stated that the working group had not sufficiently analyzed their research to the point of being able to recommend comprehensive legislative or judicial changes. The OSE promoted licensing of water uses to obtain certainty prior to adjudication. It raised concerns about changing laws to accommodate a Middle Rio Grande adjudication without a full assessment of the implications of cost, time, and the legal process issues; further, they were not convinced of the urgency of the adjudication of the Middle Rio Grande. Instead, the OSE felt that administrative proceedings such as licensing could address the practical needs of Middle Rio Grande water rights administration without precluding adjudication reform. This subcommittee is now inactive. In the 2009 session, the Legislature adopted Senate Joint Memorial 3. It required the Institute of Public Law (IPL) at UNM to conduct public meetings around the state and to obtain public comment on the water rights adjudication process. The IPL report concluded that: 1) most participants support existing law and worry about the consequences of changing it; 2) most participants want fairness, accuracy, and certainty over speed in adjudications; 3) tweaking the current system will accelerate adjudications; 4) where possible, a greater decision-making role for local authorities will help; and 5) a neutral state-funded entity to provide objective data, education, and assistance is strongly desired. Adjudications, by their very nature, are very simple in design and very complex in execution. The parties, the courts, and the legislature strive, and will continue to strive, to make them more expeditious without sacrificing the basic constitutional rights of claimants to notice and due process. By Brigette Buynak, Esq. (2008) Latest Update by Darcy Bushnell, Esq. (2014) Sources and Contributors Cases Snow v. Abalos, 1914-NMSC-022, 18 N.M. 681, 140 P State of New Mexico, ex rel. Reynolds v. Pecos Valley Artesian Conservancy Dist., NMSC-044, 99 N.M. 699, 663 P.2d 358. State of New Mexico, ex rel. State Engineer v. Rosette, Notice of Water Rights Adjudication and Court s In Rem Jurisdiction Over All Water Rights in Animas Underground Water Basin, CV , 6 th Judicial District, County of Hidalgo, State of New Mexico (Sep. 5, 2012). Statutes Taos Pueblo Indian Water Rights Settlement Act of 2010, Pub. L , 124 Stat 3064, NMSA 1978, (1907), Supervising Apportionment of Waters (1907), Determination of Water Rights (1907), Adjudication of Rights. 7 Water Matters! Adjudications 3-7 Other CLE International, Water Law, Stream Adjudications and the New Water Judges (Aug. 2004). 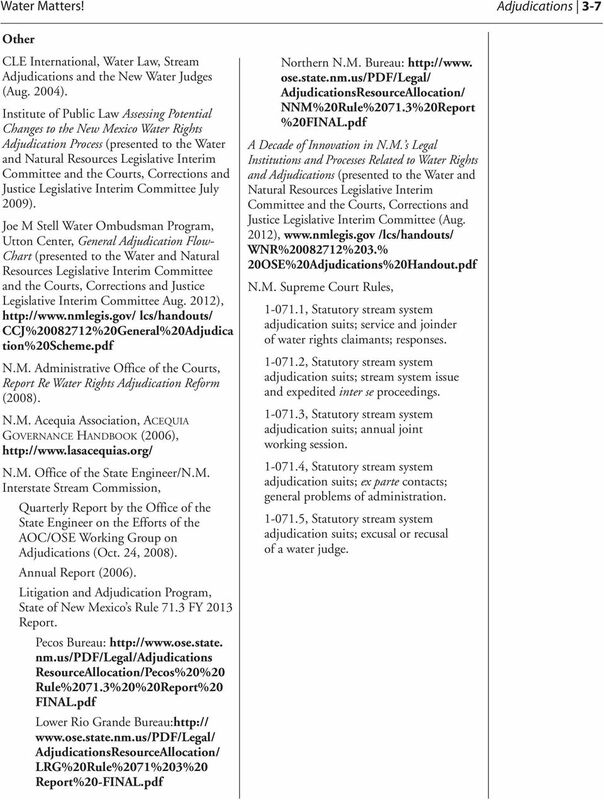 Institute of Public Law Assessing Potential Changes to the New Mexico Water Rights Adjudication Process (presented to the Water and Natural Resources Legislative Interim Committee and the Courts, Corrections and Justice Legislative Interim Committee July 2009). 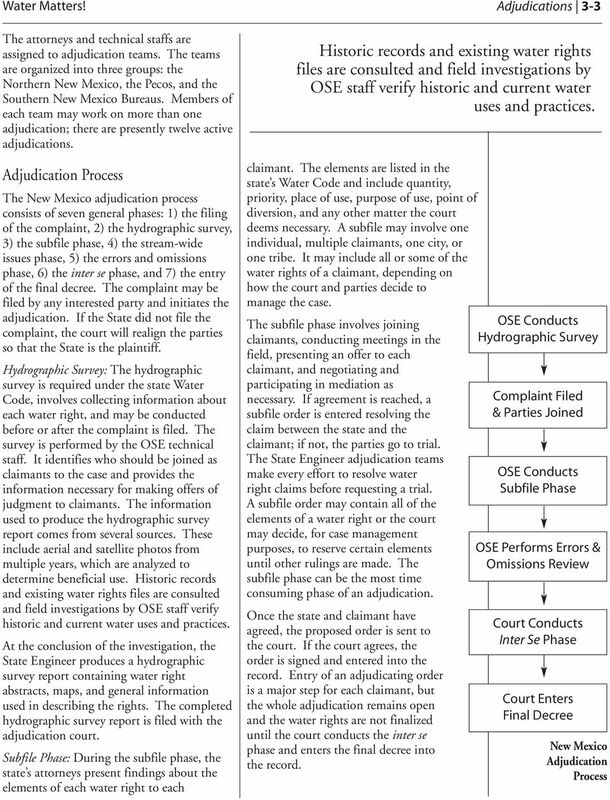 Joe M Stell Water Ombudsman Program, Utton Center, General Adjudication Flow- Chart (presented to the Water and Natural Resources Legislative Interim Committee and the Courts, Corrections and Justice Legislative Interim Committee Aug. 2012), lcs/handouts/ CCJ% %20General%20Adjudica tion%20scheme.pdf N.M. 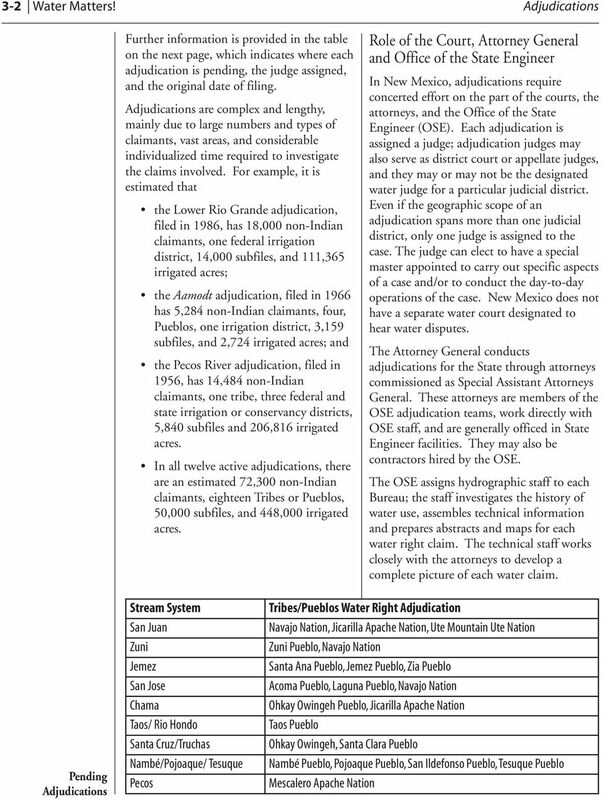 Administrative Office of the Courts, Report Re Water Rights Adjudication Reform (2008). N.M. Acequia Association, ACEQUIA GOVERNANCE HANDBOOK (2006), N.M. Office of the State Engineer/N.M. Interstate Stream Commission, Quarterly Report by the Office of the State Engineer on the Efforts of the AOC/OSE Working Group on Adjudications (Oct. 24, 2008). Annual Report (2006). 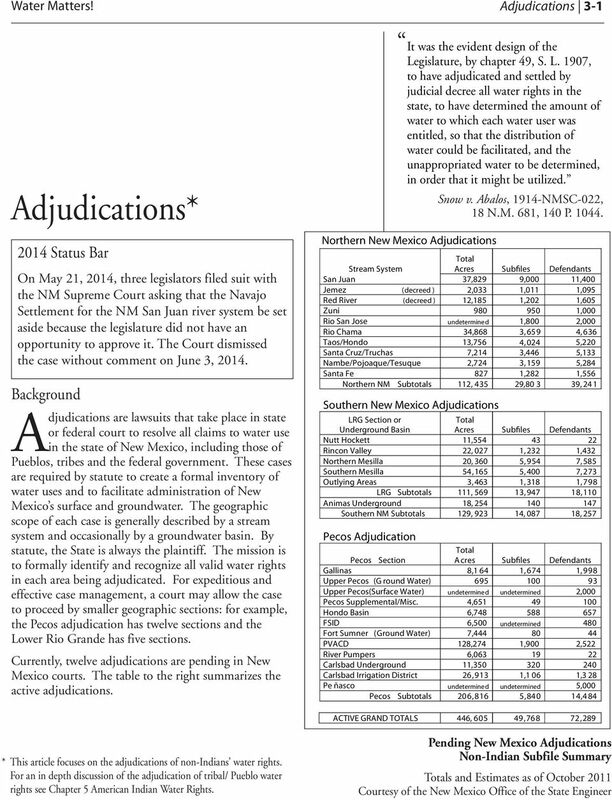 Litigation and Adjudication Program, State of New Mexico s Rule 71.3 FY 2013 Report. Pecos Bureau: nm.us/pdf/legal/adjudications ResourceAllocation/Pecos%20%20 Rule%2071.3%20%20Report%20 FINAL.pdf Lower Rio Grande Bureau: AdjudicationsResourceAllocation/ LRG%20Rule%2071%203%20 Report%20-FINAL.pdf Northern N.M. Bureau: ose.state.nm.us/pdf/legal/ AdjudicationsResourceAllocation/ NNM%20Rule%2071.3%20Report %20FINAL.pdf A Decade of Innovation in N.M. s Legal Institutions and Processes Related to Water Rights and Adjudications (presented to the Water and Natural Resources Legislative Interim Committee and the Courts, Corrections and Justice Legislative Interim Committee (Aug. 2012), /lcs/handouts/ WNR% %203.% 20OSE%20Adjudications%20Handout.pdf N.M. Supreme Court Rules, , Statutory stream system adjudication suits; service and joinder of water rights claimants; responses , Statutory stream system adjudication suits; stream system issue and expedited inter se proceedings , Statutory stream system adjudication suits; annual joint working session , Statutory stream system adjudication suits; ex parte contacts; general problems of administration , Statutory stream system adjudication suits; excusal or recusal of a water judge. Ramah Navajo Chapter, Oglala Sioux Tribe & Pueblo of Zuni v. Jewell. Class Counsel Question and Answer Fact Sheet (revised Dec.
SMALL CLAIMS RULES. (d) Record of Proceedings. A record shall be made of all small claims court proceedings. IN THE UNITED STATES DISTRICT COURT NORTHERN DISTRICT OF GEORGIA ATLANTA DIVISION : SAM STINSON, on his behalf : and on behalf of all persons : similarly situated, : : Plaintiffs : Civil Action File v.
Criminal Justice in America CJ Chapter 9 James J. Drylie, Ph.D. Page 1 of 9 Guide to Small Claims Court 1. Introduction 2. What is Small Claims Court? 3. Who Can Sue and What Can You Sue About? 4. Before You Sue 5. When Must a Lawyer Represent Me in Small Claims? 6. 1 Swedish Code of Statutes SFS 2002:599 issued by the printers in June 2002 Group Proceedings Act issued on 30 May 2002. The following is enacted in accordance with a decision1 by the Swedish Riksdag. Gloria Valencia-Weber, Emerita Professor of Law, UNM School of Law Helen B. Padilla, Esq., Director, AILC Three Integrated Statutes: - Indian Civil Rights Act of 1968, 82 Stat. 77 (Amended 2013 at 25 U.S.C. MONTANA EIGHTH JUDICIAL DISTRICT COURT, CASCADE COUNTY. Appearing on behalf of the Named Plaintiff and the Class were attorneys Daniel P.
Authority of the Judicial Branch. The authority of the Judicial Branch is derived from the Student Government Constitution, Article V.